PSA: Rainbow Brite Comic Series Has Not Been Cancelled! To read reviews by others, check my Twitter feed where I make sure to retweet them :) I can't wait for issue #3! The comic has been out for a week so it's time to dive in and do a more thorough review! SPOILER WARNING!! Do no watch unless you've already read the comic or don't mind being spoiled! Since there are so many great reviews out there, I took quotes from several of them to make points more eloquently than I could have and included them in this video. Click here to be taken to my blog post where you can find links to all of the articles I pulled from. And click here to read Jeremy Whitley's tweets regarding the two types of parenting shown in this comic. I've been having a blast reading reviews from across the spectrum about Rainbow Brite issue #1 by Dynamite. By my current count, there are 25 and that's not counting the podcasts that have talked about it as well. And the best part is that, by far, the reviews have been unanimously positive! Even the reviewers who had one or two small concerns recommended the comic to readers of all ages. I may not be familiar with the comic world, but any product that garners that many accolades is impressive in my mind! 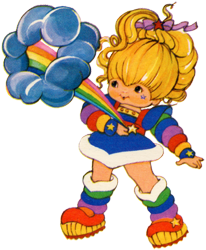 I've read reviews by die-hard fans, casual fans, folks who remember Rainbow Brite existing when they were young, and even comic readers who knew nothing about the property. Each reviewer brings a unique perspective to their experience and I wanted to share some of my favorite quotes with all of you! "Rainbow Brite has gone through more than half a dozen incarnations through the years, but this newest one from Dynamite and a solid bench of creative talents might be one of the better ones. Supported by heartfelt characterization and a genuine wit from Jeremy Whitley and expressively stylish artwork from Brittney Williams and Valentina Pinto, Rainbow Brite #1 is a grounded, but fun new take on the property, one that is brimming with potential. Sure to please long-time Saturday morning TV fans and a whole new generation of readers unfamiliar with her colorful adventures, Rainbow Brite #1 is a well-presented beacon of positivity." "The cover of issue 1 done by Paulina Ganucheau is enough to grab attention by itself. Rainbow Bright poses serenely in a beautiful piece that blends nouveau and deco into a moody technicolor dreamscape. This cover isn't eye-candy, it's eye-soul food." "The character choice to make Wisp a warrior, as simple as it may be, filled me with so much joy that I almost cried. Because, for me, she always was a warrior - a protectress who saved me from the shadows more times than I can count. I am so impressed by Whitley’s storytelling, and I cannot wait to see where he takes these characters." "I was immediately struck by the clear and solid friendship between these two girls. So much girl-oriented media engages with “mean girl” stories, the type that feed the worst examples of preteen girl in-fighting. This is especially awful when media is targeted at girls (like my ten year old) who are most likely to be vulnerable to that sort of social interaction." "This comic is perfect for all ages, with an innocuous, fun story supported by a well defined and innocent art, this creative team of Whitley and Williams manage to establish a good foundation to take this adaptation of an animated series to another level." "Jeremy Whitley, Brittney Williams, and Valentina Pinto have crafted a comic and a universe which not only covers new ground in the Rainbow Brite franchise, but also pays homage to what has come before. It is a comic which readers both young and old will be able to enjoy in equal measure. With an issue that starts like this, the future for this comic series is looking very bright." "It’s an empowering story for young girls, and girls of color as Willow herself is a black girl, that I feel would be welcomed with open arms and hearts by the targeted demographic. Rainbow Brite is the sort of story we need to bring in new readers, and to invite children to fall in love with the source content like many of their parents did at their age, and that’s a bonding experience that stays with you for a lifetime." "If this comic had any other name on it other than Rainbow Brite, it would be equally enjoyable. I am interested in seeing the story progress and seeing what elements from the original "world" is used, and what has changed. The Rainbow Brite of my generation is still mine. This new one is promising. I look forward to more!" "I honestly kind of loved it. This is very clearly targeted at a younger audience, but its got kind of a Calvin and Hobbes or Adventure time feel to it, like it has room to expand. It feels like this comic is likely to mature over time and I’m excited to see some of the content and topics that will be addressed moving forward." "Whitley's script feels charming and sufficiently saccharine, oozing a sense of effervescence. Williams' illustrations are airy and light in a way that infuses the issue with the right amount of bubblegum appearance. Rainbow Brite #1 is a very easy read that's still thoroughly engaging and a treat for readers of all ages." "Willow and Wisp are so darn likable and their adventures together look great. The addition of the parents to both of the kids was well done, and they weren’t the usual tropes for parents. These are supportive, yet sensible parents who let the kids get on with their own play. As a parent I really appreciated the writing of the characters." "When the origin story of Rainbow Brite leads with a black girl breaking from her fantasy comic to put her homemade mage hat over her natural hair and argue about Live Action Role Play with her friend, the moment is remarkable in how normal it is. She’s not a sidekick, but a precocious nerd raised by supportive, wryly humorous parents." "Friendship, particularly female friendship is a very important aspect to this comic." "When I saw the Paulina Ganucheau cover, and read the advance promotional material, I hoped this would be a brilliant reboot of the character that would still retain the appeal to an all-ages audience. What I got on the inside was not what I expected, and yet still lives up to my hopes." "Pick up this series for a child. Pick this up for an adult! In a world where violence seems to be draining the color out of everything, pick up something that will make you smile. Jeremy Whitley has won many awards for his ability to weave together stories. His most notable achievement, in this author’s opinion, is the way he makes sure there are stories for his little girl to be inspired by. He writes stories for the children that don’t “fit.” He writes for the imaginative, the fantasy-lovers, the knights of all sizes and shapes!" "Jeremy Whitely writes many comics for young girls. His characters are smart, funny, and have an excellent representation of sexualities, genders, and POCs (people of color). A must have in school libraries...I'm just saying..."
"Being a story based around the concept of color, getting the visuals right is imperative. The art style is perfect for 2018 kids, as it subscribes to the rotund looking styles of today's kids' TV shows (e.g. Steven Universe and the controversial Thundercats reboot). The lines are crisp and straightforward. The colors are gorgeous and uncomplicated. I really enjoy the variant covers, too." "If you’re looking an all ages comic that’s fun and colorful featuring young girls who easily pass the Bechdel test while setting out on a hero’s quest then Rainbow Brite is for you!" "I feel as though things will liven up much more later on in the story." "From that one scene, I get the feeling we as readers may be presented with the concept that it doesn't matter where you come from or how you're raised, its who you become that decides your destiny. Being able to take these kinds of complex thoughts from such a simple premise is pretty cool, and I'm glad this series is going to continue. The television show from the 80's was such a fun and engrossing experience and I hope the comic can capture some of that radiance as it builds." "This was a really nice set up issue, The art is fantastic and Whitley again showcases his talent for writing authentic young women. It will be fun to see how this series develops." "Our heroines are creative, innocent, and fun, which is the perfect description for this series so far and exactly the type of book we need more of in these often dark, colorless times." "As colour is a very important part of the story, it draws your eye to how Valentina Pinto applies it. For the most part, we get a lot of bright primary colours. From the opening writing sequence through to when Wisp returns home at night, everything’s bright and colourful. It’s only when she’s confronted by the shadow brutes that we start to see a change. Given the final page of the issue, I’m very interested to see what happens in Rainbow Land." 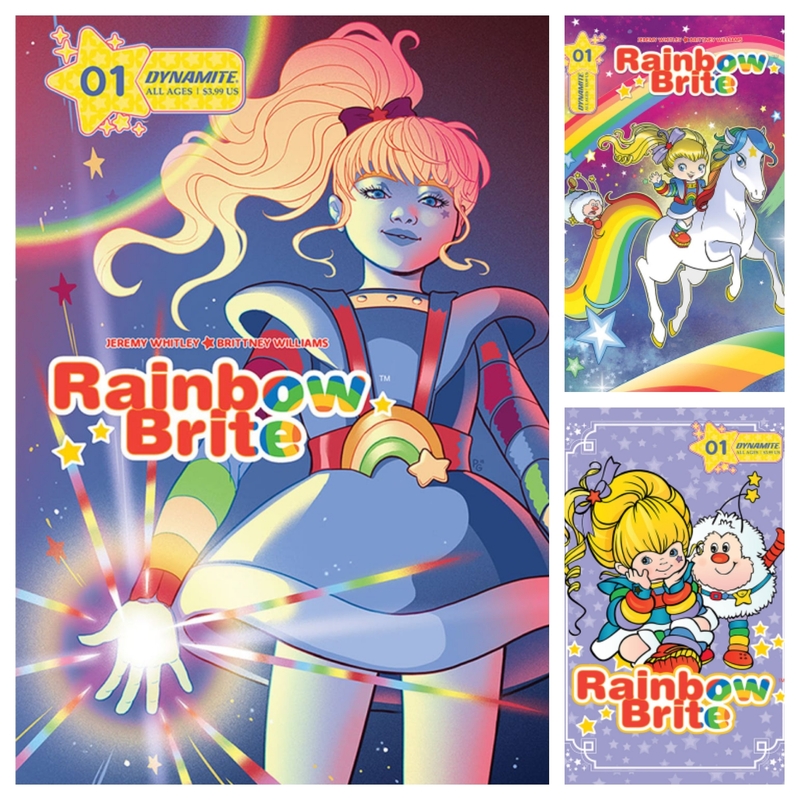 "After reading issue 1 of Dynamite’s new Rainbow Brite comic, I’d suggest those picking up this comic on brand recognition alone might need to adjust their expectations accordingly. Regardless, every story has the potential to be someone’s first experience of a particular genre; and this would be a solid introduction to the world of Rainbow Brite." "The illustrations are bright and eye catching, the writing is witty and fun but not so much that it would go over the heads of younger readers. The lettering is well placed and non-intrusive which again for younger readers and readers like me with dyslexia makes all the difference." "Rainbow Brite #1 is a shining example of what an all-ages title should aim for. It obviously is going to be more light-hearted and innocent than your normal comics, but it doesn’t shy away from subtlety and nuance. Most all-ages titles feel that they have to explain every little thing in extreme detail, but Rainbow Brite #1 is content to let you put some pieces together." Now that the comic is out for everyone to read, I'll be recording my own non-spoiler-free review soon, but I'm sure I'll be echoing many of these wonderful comments as I add in my own! What do you think of Rainbow Brite issue #1? 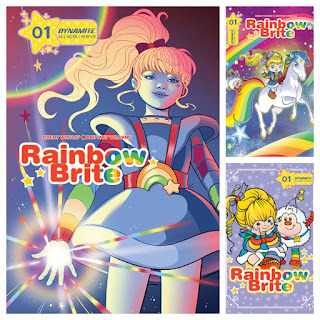 Jeremy Whitley, author of the upcoming Rainbow Brite comic series, has been conducting interviews to answer questions about this exciting new project. I got to conduct one of those interviews myself! But I wanted to include links to all of his interviews here so that you'll be up-to-date on all of the latest developments in this upcoming story. Check 'em out! Each interview leaves me more and more excited to read this new chapter in Rainbow Brite's history! When the news broke about the upcoming Rainbow Brite comic book, several fans took to Twitter to announce their excitement. Here are some great tweet responses from the team working on the comic itself! Glad you're excited! I may have used your site for reference a time or two! Well it's been a ball to write so far. We're trying to honor the original while adding some new wrinkles. Hopefully you love it too! Luckily she's cute and rainbow colored. So it was still in my wheelhouse.